Thoughts, observations and journalism from a reporter in Austin, Texas. Update: Ana Rodriguez, the deputy chief of staff for bill-author Rep. Eric Johnson, said the legislation was not intended to make the AG’s office the “fact-checkers” for the reports, but instead to host the information online so it would be available for others. The Parker County issue “reflects reflects an adjustment period as law enforcement agencies figure out how they’re supposed to report these cases,” she wrote, adding she will work with the AG’s office as the process is fine-tuned. Previous post: Don’t expect the Texas Attorney General’s office to ensure that police agencies are reporting officer-involved shootings in accordance with a new state law. I’m keeping a database of the reports, which departments so far have filed on 14 shootings, five of which were fatal. After noticing that the Parker County Sheriff’s Office filed one report for an incident in which two officers killed a man – while other departments have filed separate reports for each officer involved – I contacted the report’s author to clarify. My email was forwarded to PIO Danie Huffman, who told me Tuesday hat my query was “at the very bottom” of her to-do list. It also requires departments to file a report within five days of the shooting, and directs the AG’s office to post the report online within five days of receiving it. Several reports have been submitted long after the five-day mark – including one filed Tuesday on a shooting 30 days earlier. A recent peek into the officer-involved shootings that Texas departments have reported to the state attorney general’s office revealed a peculiar one from Plano. Anyway, this one report from Plano said the Sept. 3 shooting occurred during an “accidental discharge ricochet during range actives” at the Plano Police Department’s shooting range. Still curious, I called Plano PIO David Tilley, who said an officer accidentally fired a shot into the ground during the department’s annual inservice. A piece of the bullet ricocheted off the ground and grazed another officer’s elbow. There’s an internal investigation per department protocol, but Tilley said neither officer missed any work over it. It’s unknown, though, if the officer passed his qualifications. Four people have been shot and injured by Texas police since Sept. 1, when a new state law requiring departments to report such incidents to the Attorney General went into effect. HB 1036 requires the reports to be submitted within 30 days of an incident, and directs the AG’s office to post reports online within five days of receiving them. The reports detail demographic and other basic information about incidents, which I then used to create a database. In half of the shootings, the person shot had a weapon. Three of the injured people were men and one woman was shot during a call for a vicious dog. Bovine bandits are on the rise – or are the cows just coming home? Recent news stories have reported that the centuries-old crime of cattle rustling – or stealing cows – is alive and well in Texas, thanks to rising beef prices. In 2014, they investigated about 800 complaints of missing or stolen livestock – including about 4,000 cattle – and filed criminal charges in 36 cases. Cattle rustling is a state felony, punishable by up to 10 years behind bars. This year, TSCRA has investigated 463 case reports and recovered $1.16 million in missing or stolen property, spokesman Laramie Adams said. No bull – the price of cattle has clearly risen over the years. 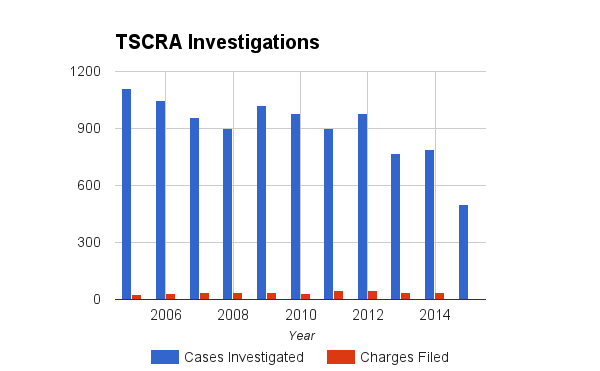 But I didn’t find a similar increase in the number of criminal charges filed, which has remained fairly steady. Adams wasn’t sure of the value of property TSCRA investigators recovered in previous years. “In a lot of them, the cattle are located. They’ll report it stolen, and we may have found it, or it may have strayed off and it’s in a neighbor’s pasture, or the sheriff’s office may have impounded them,” said Larry Gray, TSCRA’s director of law enforcement. Ranching is a multi-billion-dollar industry, and cattle represent half of Texas’ agriculture earnings. Got cows? Keep a watchful eye on your herd, and make sure they’re branded. 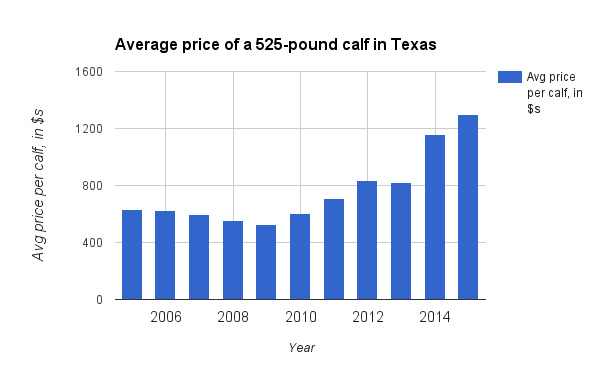 Note: I used the USDA’s statistics for medium and large feeder steer auctioned in San Angelo, and calculated the cattle price with the assumption that each calf weighed 525 pounds. Are states writing – and repaying – IOUs for execution drugs? In 2013, the Virginia Department of Corrections gave Texas some pentobarbital, a drug used in lethal injections. Two years later, the Lone Star State has returned the favor. According to Jason Clark, spokesman for the Texas Department of Criminal Justice, Virginia officials approached Texas, which “reciprocated” by giving Virginia three, 50-milligram vials of the drug. Buzzfeed on Thursday reported on the drug exchange after it was revealed in an Oklahoma death row inmate’s court filing. In response to an open records request made by inmate Richard Glossip, Virginia released a receipt for the three vials dated Aug. 26, 2015, listing “Tx Dept of Criminal Justice” as the “supplier,” Buzzfeed reported. The Oklahoma Department of Corrections uses midazolam to carry out executions, and says it’s unable to obtain pentobarbital. Glossip is scheduled to be executed Sept. 30 and has challenged the state’s use of midazolam, which was used in the 2014 botched execution of Clayton Lockett. The Supreme Court of the United States ruled in June that Oklahoma could continue using midazolam, and Glossip’s lawyers recently had a hearing in the case canceled after determining they couldn’t prove that an alternative drug could be obtained in time. Glossip’s Thursday filing was intended to highlight the “factual dispute regarding the availability of pentobarbital,” his lawyer wrote: In other words, if Texas is producing its own pentobarbital, then Oklahoma could, too. When asked if TDCJ is indeed compounding its own pentobarbital, Clark wrote in an email that the vials were “legally purchased from a pharmacy,” and no money was exchanged between the two states in either occasion. Texas has a history of keeping secret the names of the compounding pharmacies that supply its execution drug. That shroud of secrecy was strengthened by a new state law, which went into effect Sept. 1 and mandates the suppliers remain anonymous. Late last week, I was tasked with covering Army Sgt. Bowe Bergdahl’s Article 32 hearing for The Daily Beast. Bergdahl, 29, left his post in Afghanistan in 2009, was subsequently captured by the Taliban, and spent five years in captivity. President Barack Obama traded five Taliban prisoners for Bergdahl in 2014. Amid rumors that Bergdahl had assisted the Taliban and left his post on his own accord, he was charged with desertion and misbehavior before the enemy in March. 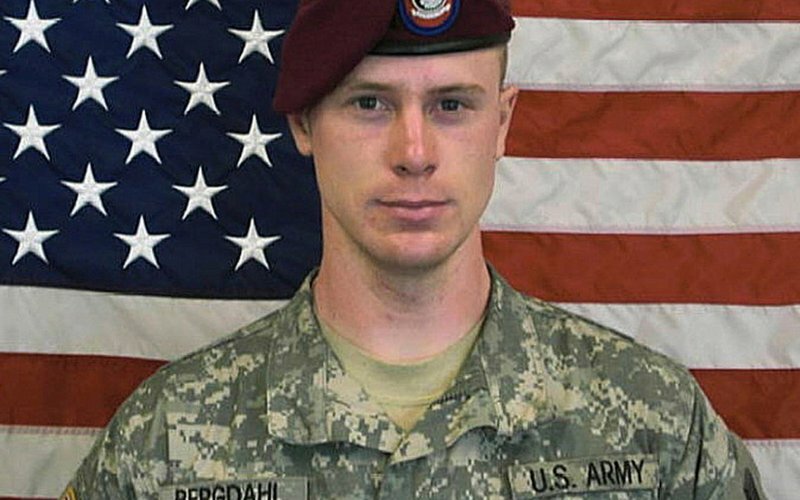 Can Bowe Bergdahl get a fair trial after publicly being called a traitor? The police research and policy group’s recent message to law enforcement was clear: It’s time to overhaul training and culture regarding the use of force to consider the sanctity of human life. An August report by PERF, or the Police Executive Research Forum – which comprises police chiefs from major U.S. cities – rehashed the group’s May conference, when brass from across the country discussed the subject of use of force. The conversations are among a series of PERF discussions prompted by events – starting with the deaths of Eric Garner and Michael Brown – that have shaken the police profession like a “series of small earthquakes,” wrote PERF Executive Director Chuck Wexler. Federal courts have ruled that an officer’s use of deadly force is considered to be reasonable – and not a constitutional violation – when the officer has reason to believe the suspect poses a threat of serious harm. But just because they “can,” does that mean they “should”? Wexler says a growing idea among police is that the review of an officer’s use of force should also include what led up to the incident. He also calls for more training on de-escalation techniques, which some departments have already undergone. After the death of Garner, for example, all 35,000 New York police officers were mandated to undergo three-day training courses. One day was dedicated to “Smart Policing,” where officers learned de-escalation tactics and techniques.